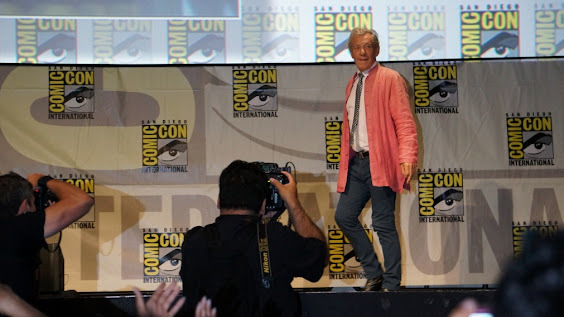 Full transcript of Comic-Con Hobbit Panel Q&A! 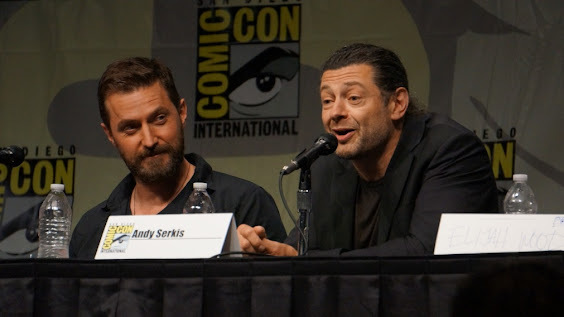 In case you don’t have much bandwidth, or can’t get to Youtube for whatever reason, here’s a complete transcript of the Hobbitcon Q&A from Hall H. Quick warning: it does have some swearing at the end when Andy Serkis shows off his Gollum voice for the audience. And it does contain some spoilers. Some great answers from Martin Freeman and Richard Armitage to questions about the prosthetic gear, from Peter Jackson about how the Extended Edition process works, and some interesting stuff from Philippa Boyens about Galadriel. Thanks to the swift typing skills of Barliman’s chat regular Jenniearcheo in putting this together! Also, if you want to view another version of the panel in higher quality, head here. The video quality is better and it has the last three minutes of the panel that was not in the previous version we saw. However, it’s from further back in the hall so the sound suffers a touch. Thanks to Elpidha for the find! 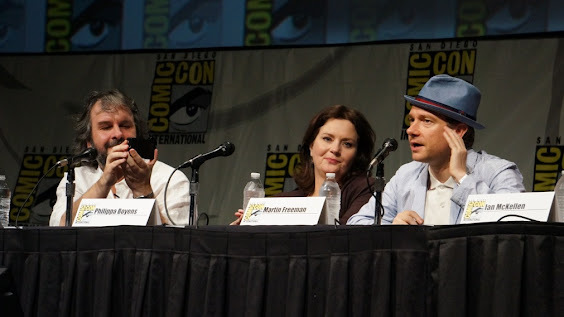 The Hobbit ComicCon 2012 Panel in Hall H, 14 July 2012. 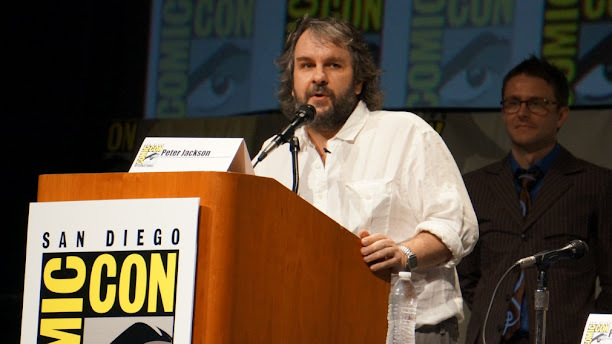 Peter Jackson: Hi everybody. Thank-you very much for coming. I’m, um, we’re actually in production on a new video blog which is gonna give people who couldn’t come to ComicCon just a sense of the experience of being here. So I’ve been recruited as a second-unit cinematographer. Actually, Chris has. [Retrieves phone from Chris.] I just want you to do something for our blog, for all the people who couldn’t be here. When I say one, two, three, could you just say “Hi from Comic-Con!”? Okay? “Hi from Comic-Con.” So just wait. PJ: Fantastic. No need for a take 2. That was bloody good. So who has been camping out on the street outside? PJ: You poor sods. You poor, poor bastards. But thank you very much for doing that. Just before we go on, who here regards themselves as being a “Tolkien geek”? 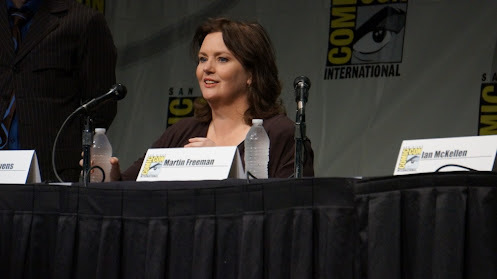 PJ: Well, I’m going to introduce someone who is possibly a more avid Tolkien geek than any of you, our co-producer and co-writer, Philippa Boyens. PJ: All right. So, I’m sure we’ll hear from Philippa later. Especially if you have some tricky questions for her. I guess we should probably run you a bit of footage, shouldn’t we? PJ: Did you want to say a word? Oh, you want to watch the footage. Ah. Well, I don’t know. Anyway. So just a couple of little quick disclaimers. The music tracks that you’ll hear are just temp tracks. There’s a little bit from Lord of the Rings, there’s a couple of tracks from some other movies. Howard Shore hasn’t started to record his music for this yet. I think he starts recording with the London Philharmonic in about five or six weeks. So there’s none of Howard’s Hobbit score to be viewed on this reel at this stage, unfortunately. Most of the effects shots are not finished. There’s some that look pretty good, there’s a few that are a little bit dodgy, but I’ve picked footage where the effects are mostly along the way, somewhat. And you also, even though at the end the title comes up, The Hobbit: An Unexpected Journey, there is a bunch of clips and shots in here from the whole story. It’s not just from the first movie. Just for Comic-Con. PJ: So should I shut up and just run it, eh? PJ: Thank-you very, very much. I hope that was worth the wait. Thank-you very much for your support everyone. We really, really, really appreciate it. This is a film made by fans, for fans, believe me. So let’s without any more ado, let’s bring up a few more of our friends that we have here. So our second unit director who also plays a small but significant role in the movie, Andy Serkis. PJ: And we also have a surprise guest which I thought would be fun to bring out on stage. We found Frodo out the back. CH: Yeah, that is exactly… I am equally overwhelmed, by the awesomeness. Welcome, everyone. This footage is stunning. Stunning footage. You guys just saw over Twelve-and-a-half minutes of The Hobbit. And I think I want to take this right to audience questions if I can, because I know a lot of people waited and you guys have some questions, so let’s just open up the floor right now. The Button Lady! CH: You thought I was kidding. BL: And the question is, I coulda swore I saw you I make-up in a shot online. Peter, where will we see you in the film? PJ: I actually haven’t shot my cameo yet, but I’m due to shoot it tomorrow when I get back to New Zealand, seriously. I won’t be difficult to spot this time around, but I’m not going to tell you where I am. I’m the handsome one. You’ll recognize me. CH: Hello. What’s your name? PJ: That’s a great question for Philippa. Philippa Boyens: I, yeah, there are. Galadriel, as you all know, is the most powerful being in Middle Earth, at the time. And we wanted to go in there and tell that story. We worked with Cate. We talked to her about the role. She did a phenomenal job. I was… I had my total geek-out moment when she stepped up. And, the battle of Dol Guldur. Let me just say that. It’s extraordinary. So she immediately brings a very powerful feminine energy into the film, and one of the reasons… It’s interesting that you did that, because we did feel the weight of it being a “boys’ own” story. After a while, you’d feel the weight of it. And we did create a character. Her name’s Tauriel, who is an elf. Who is played magnificently by Evangeline Lilly. PB: Who you saw a little bit of. She’s our redhead. We created her for that reason. To bring that energy into the film, that feminine energy. We believe it’s completely within the spirit of Tolkien. You know, we tried really hard, and she wanted that more than anything, herself. She didn’t want it to be a ploy. We wanted her to sit in the world, and I think you guys are going to fall in love with her. CH: Excellent. Thank you. Sir Ian McKellen? [Ian looks at him expectantly.] I… [geeking out] I just want to say Hi. Ian McKellen: How are you? What are you doing here, actually? CH: I’m moderating a panel at the moment. IM: Ah, and all these folks? CH: Oh yeah. I always wondered what the hobbit feet feel like, to like, put on and bounce around in? Martin Freeman: Uh, they’re good. For the first few days it’s a little bit like a fledgling duck, finding your flippers. But after that, they’re surprisingly easy. They’re kind of . . . you can forget that and just carry on with the scene and playing the character. Whenever I was having a hard day, or a tiring day, I had just a bunch of other people to look at and I was having a relatively easy time of it, physically, because everyone in huge prosthetics and big costume rigs were being far more heroic than I was. So maybe Richard should talk about that. Richard Armitage: We went through quite an evolution with the look for Thorin, and of course, all of the dwarves, who are very clearly defined by their features. Working in a prosthetic like that was one of the biggest challenges because you really have to work your face harder to portray what you’re trying to express inside, and on day one I really didn’t think I was going to make it anywhere close to two or three weeks into the shoot. But by the end of the journey, it’s… I couldn’t work without it, and I didn’t recognize the person underneath it. But managing the heat and the stench of sweaty dwarf was a challenge in itself. CH: Excellent. Thank-you. [Profession of love by crowd member to RA.] Hello. What is your question? Brazil guy: Hello. I love you guys. I came all the way from Brazil just because of you. Just because of you. I spend all my money on this trip, but it was worth it. Before I make my question, Ian, I am your biggest fan. I love Gandalf, Magneto. You are the greatest, man. You are the greatest. I have a simple gift for you from Brazil. IM: Oh, make sure I get that. Brazil guy: Thank-you. Thank-you very much. It’s a T-shirt signed by [Brazilian mixed martial artist and current UFC Middleweight Champion] Anderson Silva as he parted from me and I would like to give it to you. And my question is for Peter. I’ve gotta know this. Will you make a movie about Silmarillion? PJ: I think the chances of me living to about a 110 are very remote. No, the Silmarillion is totally owned by the Tolkien estate. It’s not owned by Warners or MGM like The Hobbit and the Lord of the Rings are. So, I don’t think the Tolkien Estate liked these movies at all, so I wouldn’t imagine that the Silmarillion’s going to go anywhere for quite a long time. Brazil guy: You guys are awesome. Comic-Con’s awesome! Thank-you, guys! UCSB guy: I kind of can’t believe I’m up here right now, but my question’s for Martin. But first I just wanted to say, Sir Ian McKellen, I’ve grown up with your acting, Gandalf, Magneto, whatever, and it’s just, your performances have always been very, very special to me, so thank you for that. My question for Martin, though, is were you, like, intimidated or under pressure because you were joining such an ambitious project that’s already been established with so many other actors and people who have worked on the previous films. MF: In all honesty, it might sound a bit disingenuous to say, but I honestly didn’t feel a huge amount of pressure. I certainly didn’t feel intimidated. Once I’d met Peter, Fran, and Phil, I felt relaxed with them. I felt that they were recognizable human beings. They weren’t trying to impress me, they weren’t trying to… They weren’t trying to do that stuff to me which sometimes people can do, which is like, “Do you realize how lucky you are?” kind of thing. I mean, they weren’t doing that to me. They just wanted me to be in the film. And that really made /me/ want to be in the film. And obviously you can’t really take intimidation or pressure to work with you, because you won’t do your best work, and you won’t do your best playing, which is an actor’s job. So when you’re doing scenes and when you’re just going to work day-to-day you’re not thinking about this [gestures towards room]. I mean, you’d go mad if you were thinking about, “How’s Comic-Con going to react to the way I choose to move that bottle [moves water bottle on table]. MF: It’s very remote when you’re actually doing the work. And it’s a friendly place to work, as well. It’s kind of its own little world, Wellington. Co-Wellington. And it feels like a sort of special little place where these films are made, where your only job is just to go along and enjoy it and do as best you can. I can honestly say I wasn’t… I mean I had to find my way into it. It’s not like I just hit the ground running and there was Bilbo. I had to find my way in. Between me and Pete, we negotiated and he usually won. MF: But no, I never felt intimidated by it at all. Thank god. Because it’s just meant that I was able to hopefully do my job. CH: Excellent. I’m curious. Elijah, have you… had you seen the footage before? Had you seen anything? Did you watch? CH: What did you think? EW: I was blown away! Extraordinary. I mean, the footage as well was so, I mean it’s incredible, but it has these amazingly emotional moments. And that’s, I think, at the heart of what Peter does in his storytelling. And what Philippa and Fran write. And to see that presence in this footage… ’cause I’m so distant from this, truly. I really went to New Zealand for a month last year to do a bit of work, but… it’s beautiful. I was made to feel emotional watching that footage. And to see everyone here. It’s wonderful. CH: And I think, you know, the reason that everyone has a story to tell before they ask their question is because this is such an emotional story for people and everyone connects to it on such a personal level. And I think that’s why there’s so much, like, you know, “Here’s why this affected me” first before I ask my question. Which is a testament to the work. What is your name, sir? CH: All 20 miles away. All the way. Alex: First I want to thank Ian for last night visiting the guys who camped out. You’re totally awesome. IM: It was nice for me, too. Great. Alex: And my question is for Peter Jackson. Me and my sister are great admirers of you. I mean we admire your work. And my question is, what is the process to select the scenes that will be in the theatre, and then the ones that will be in the extended edition? PJ: That’s a good question. People often assume that we shoot scenes /for/ the extended cut. You know, that this scene is somehow earmarked at the beginning as not for the movie, which is not true at all. I mean, you literally write the script… well the theory is that you write the script before you start shooting. But it never quite works that way with us. We write the script /as/ we’re shooting. And you shoot, and you shoot, and you shoot some more and, you know, the scenes, the stories develop, and I mean it may be that we write a scene halfway through the shoot that we think we need to tell some of the story. And so anyway it’s very organic and it’s not until you get to the very end and you can start to look at a “cut” assembly of the film that you start to realize where there’s repetition, where there’s slow patches, and… you basically… Look, at the end of the day, you end up with a film that’s too long. And so for purely, for what the studio and the distributors need, you need to trim it down a little bit. Which we try and do. We’re not very good at making short movies, unfortunately. PJ: Still a skill I’ve never mastered. But, um, anyway, you kind of end up with a theatrical film, at a length that you think is what it should be for the experience. And then you look at what got cut out. And we don’t put everything back in because you literally cut out scenes that you don’t need and are of not a huge amount of value in hindsight. But when we cut scenes out that have nice character moments or nice further information for the story then we love to put those in the extended cut. So it is a very organic process. You don’t really know until the very end what’s going to end up in the extended cut. But there will certainly be extended cuts of these films, I’m sure. EW: Thanks, Chris. [Examines card.] Aaah, I love that. CH: I even did a little Comic-Con eyeball on it. Did you notice that? On the side? CH: Thank-you. Actually, we haven’t heard from Andy yet. Andy, I think, anything. What is this like, you know, coming back? Andy Serkis: Well, where should I start? I was only supposed to be coming back for two weeks to play Gollum again. Which I was very much looking forward to, of course. AS: It’s not unusual to do that sort of thing in this company. And of course, once I picked myself up off the floor I was on that plane, of course. I mean, it was a remarkable and extraordinary experience for two counts. One, obviously working with Martin, who I’d wanted to work with for a long time, and to get the chance to play opposite him for that scene, which was a great experience, and one of… /was/ the first thing to be shot in the movie actually. We spent two weeks shooting the entire scene a number of times. Pete wanted to let it feel like a theatre piece where we really play off each other and Martin could find the character of Bilbo. And it was a really really amazing way of working, and it was terrific. And then I began a process of jumping into the director’s chair, putting on the 3D glasses, getting to grips with 48 frames a second, a crew of 160 people, cranes, techno cranes, a schedule, dwarves, dwarf doubles, scale doubles, stunt doubles, a schedule that kept changing every two minutes, and it was a huge film education for me. And enabled by the greatest mentor possible. Peter’s been an immense part, immense part of my life for the last 12 years, and Fran and Philippa, they’ve given me such incredible opportunities, and I will eternally be grateful to them. They’ve honestly made a massive, massive difference, and to be trusted with that, that position, was a dream to behold. So thank you from the bottom of my heart. Gollum: For f$#@’s sake, do I have to do this? You said you weren’t going to whore yourself. You say it. But you get in front of six thousand five hundred f#$%’in people, what you gonna do, Precious? CH: Man, that Ring changed you, man. We have time for one more question. What is your question, ma’am? Camp-out lady: Wow, I camped out overnight for my first time in eight years with all of these lovely strangers and it was awesome. But my question is primarily for Martin. I think that part of the lasting appeal of The Hobbit is this universal story of an ordinary person overcoming not just extraordinary circumstances but his own fear and self doubt. And I’m curious whether you drew on any personal experiences to understand his motivation for stepping over that threshold. MF: Um, not directly. And if I did I wouldn’t tell you. But only in the universal human sense of that you can empathize with people who have… we all have fear, and we all have reservations, and we all have places that we’re scared to go. Whether they’re internal or they’re external. So it’s certainly something I can relate do. I mean that’s part of your job as an actor is just to be relatable to things anyway. And I guess beyond that, part of it is just casting. You know, I didn’t cast myself in it, so whatever they saw… They [points at Peter and Philippa] saw… That’s them, was, they thought would be helpful for me to play Bilbo. But I didn’t, no it was more kind of, I’m a big believer in knowing what play you’re in. And in this play I have to sort of be, in the way, the eyes and ears of the audience. Because I’m the nearest thing to an audience member that there is in the film. I think Bilbo has to be relatable to, has to be empathetic. And so my job, partly, is to relay that by just being open and just being… having a certain vulnerability. Having a certain wit, and a certain lightness of touch. You can’t be too heavy. It can’t be too riven with anything. So, yeah, I mean… I just turn up. CH: Well, you guys have been… Oh, did you want to say one more thing? MF: No, I’m just saying thank-you! CH: Oh, all right then! Sorry! Everything’s ruined! Let’s just go home! Um, you guys have been more than generous with your time, and your footage. Please, you guys, help me thank New Line Cinema, Metro Goldwyn Mayer. The Hobbit: An Unxpected Journey premieres December 14th, of this year, just five more months to go! Peter Jackson! Philippa Boyens! Martin Freeman! Sir Ian McKellen! Richard Armitage! Andy Serkis! And of course, Elijah Wood! Thank you so much, you guys for spending two-and-a-half hours with me. This has been a tremendous honor! I’ll see you here tomorrow for Dr. Who. Bye everyone! Have a great Saturday at the Con!